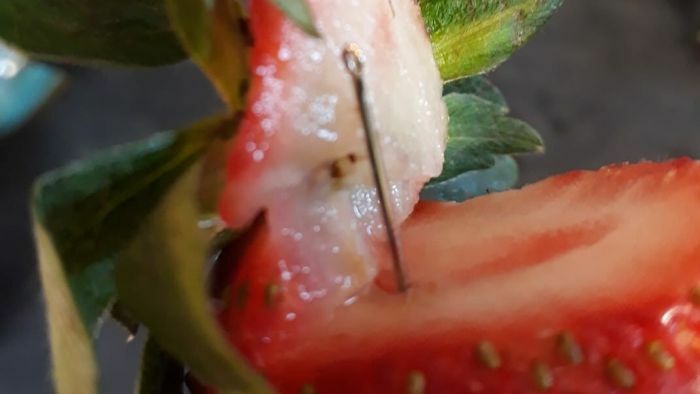 New South Wales Police have confirmed the first case of strawberries contaminated with needles bought from a Sydney supermarket. The needles were discovered in three strawberries in a single punnet, which a customer had bought from Coles in Engadine in Sydney’s south. Coles issued a statement today saying it had already removed Donnybrook strawberries as requested by Queensland Health, but now it would remove all brands of Queensland grown strawberries for the time being. Premier Annastacia Palaszczuk, urged the community to come together to find the person responsible behind the “callous act”. “This is putting families’ lives at risk and it’s also putting the strawberry industry at risk,” she said.